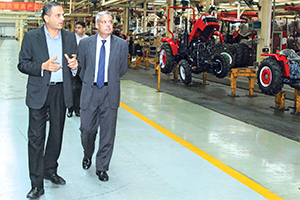 Sachin Arolkar (left) at our tractor plant. I’m Sachin Arolkar and I currently handle the Mahindra Ford Alliance within the Mahindra Group. Before my current role, I spent over two years working at Mahindra’s tractor JV, Mahindra Yueda (Yancheng) Tractor Company Limited in China which proved to be an immensely enriching experience, both personally and professionally. Getting used to initial greetings is the first step towards entry into China. ‘Hello’ is often both the start and end of a discussion in English. The main reason for this is that most Chinese, including students studying English are too shy to try their English with a foreigner! Language, culture, climate, food and a world without Google were the challenges I was aware of before I went to China as an expat. However, as I slowly settled into the country, I realised that many of these could be managed through a willingness to learn and accept change. With translator apps, local assistance and learning the language through a local tutor, I found I could manage the language. However, the script always remained a mystery to me, and this could hamper basic things like differentiating between a shampoo and a conditioner. Understanding local culture has in fact, been the most interesting aspect of expat life for me. The list of do’s and don’ts which most websites provide is a good starting point, but again only a starting point. Keeping an open mind and noting differences is also very important. Having colleagues from India who had spent a long time in China was a big help as they took the trouble to educate me on aspects of local life with which I would have otherwise struggled. Food is invariably the most important topic for those travelling to China! Food is invariably the most important topic for those travelling to China! We have all heard stories of vegetarians struggling to find options at mealtime. In fact, I would say that even non-vegetarians have several issues. My experiences, however, suggest otherwise. I was surprised at the variety of vegetarian dishes available throughout China. Most restaurants have menus with photos of the dishes on offer and this makes your selection easier. A willingness to forego the staple Indian diet of rotis and dal-rice is essential if you wish to live in China. 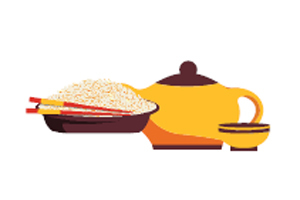 Bread is also a rare commodity in the interiors of the country, while noodles and dry rice form the staple diet. Vegetables are available in plenty although the way they are prepared is very different from the way they are cooked in India. The ability to eat with chopsticks is vital or else it is advisable that you travel with your own fork. Let me say that eating with chopsticks takes a special talent! The country and its people certainly made my stay in China an enriching and memorable one and an experience I will always cherish. The climate in China tends towards extremes. 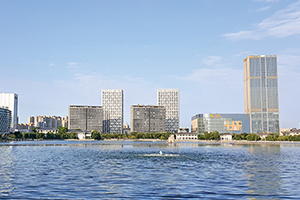 In Yancheng, my home city, the temperature usually ranges between -10 degrees and +40 degrees. The extreme winter brings its own challenges and as luck would have it, while I was there, Yancheng had its most extreme winter in over 20 years with temperatures dropping to -20 degrees. The city was not geared up for this temperature and the water pipelines burst, leaving its inhabitants without water for a few days. It was quite an experience to say the least! Working in a company in China with 1000+ employees has its own set of challenges and once again I consider myself lucky to have colleagues with extensive experience in China who were always on hand to guide me. Interestingly, the local team had also learnt the way Indians work and were happy to teach me the differences in the work culture. With my Indian and local colleagues as my guides, adapting to the working conditions proved to be an easy task. With the company’s dealers spread all over China, I was required to travel over long distances. However, excellent road infrastructure ensured that this was a smooth experience. Distances of up to 400 kms between any two dealers could be covered by road in a few hours. I preferred to visit our customers - usually farmers - at their farms as these visits were an opportunity for me to gain deep customer insights and I also learnt a great deal about the way business is conducted in China. The geographic spread of the country encompasses deserts, grasslands, forests, plateaus and snow-clad mountains which proved to be an opportunity for the traveller and photographer in me to see different places and to try my hand at photography. I was also lucky to get a chance to see the deserts of Xinjiang, frozen rivers in Heilongjiang, grasslands in Mongolia and the beauty of Tibet.